AP Still Avoids Dem ID of Corrupt PA Judges After Briefly Doing So, Then Dropping, In Feb.
Here’s a “Name That Party” follow-up. 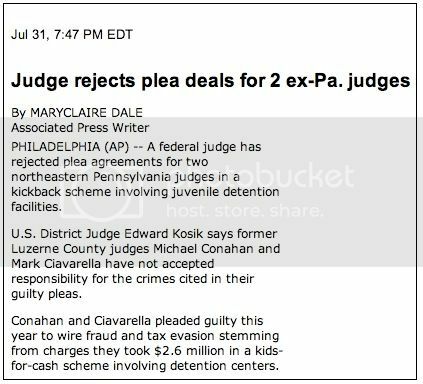 In a February post (“AP’s ‘Name That Party’ Twist: Disgraced PA Judges’ Dem Party ID Disappears After Initial Inclusion”; at NewsBusters; at BizzyBlog), I noted that the Associated Press had originally identified the party of two Democratic judges involved in a shocking scheme that pushed thousands of juvenile offenders into detention centers for minor offenses in return for millions in kickbacks. 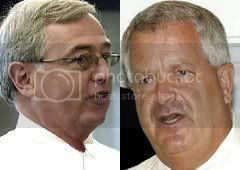 However, in longer subsequent reports, the AP dropped the party affiliation of Luzerne County Judges Mark Ciavarella (pictured at left) and Michael Conahan. 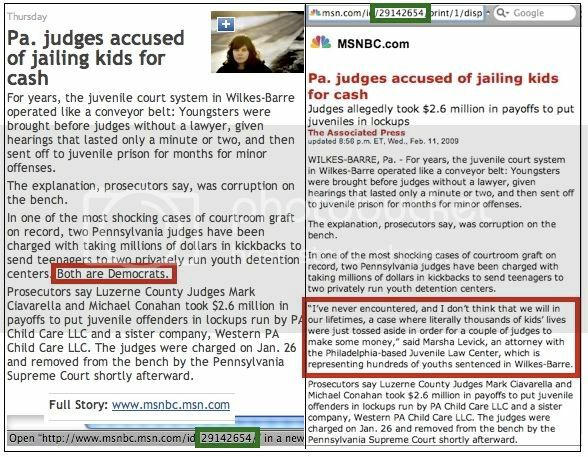 The red box on the left shows where the story as carried at Topix identified the two judges as Democrats; at the time, it was the only place I found the identifying sentence. The red box at the right shows a paragraph that was added later by AP at the MSNBC link; the “Both are Democrats” sentence originally in the previous paragraph is gone. No form of the word “Democrat” appeared in the revised story at MSNBC; that is still true today. The green boxes show that the specific story linked by Topix is indeed the MSNBC story on the right. Short of an open admission, the pulled party-affiliation sentence following a brief, demonstrated appearance is probably as convincing a piece of evidence as we’ll ever see that many members of the press, particularly alleged journalists at “The Essential Global News Network,” are deliberately playing “Don’t Name That Democrat” whenever they can. AP’s original instincts back in February were correct. People, especially parents, would of course be curious about the party affiliation of corrupt judges in a horrible case like this. 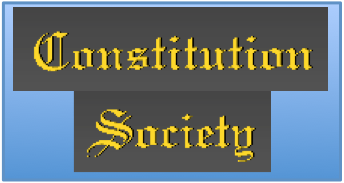 Ciavarella’s and Conahan’s party is avoiding a deserved stain in this matter, especially given the AP’s tendency to rediscover its Stylebook’s party-naming rules when Republicans and conservatives are involved in crime, corruption, or scandal. Judging, if you will, on past behavior, it seems very unlikely that the AP would have pulled the Democratic judges’ party affiliation after an initial identification had they been Republicans. 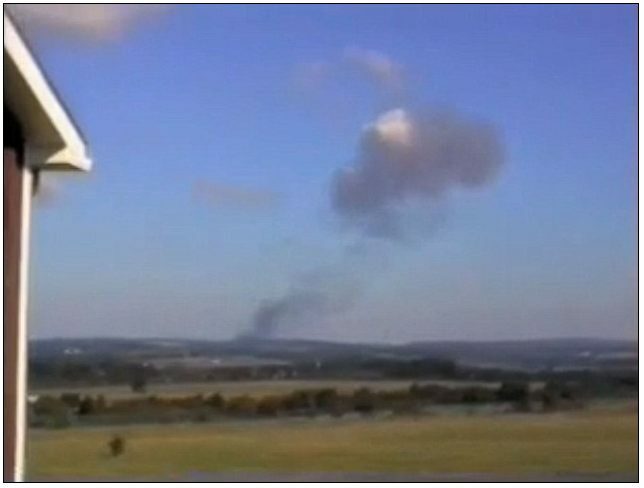 All in all, it’s just another day of “Cover For Democrats and Liberals Whenever Possible” in AP-land. This one’s just more outrageous than usual. BizzyBlog Update: Former Judge Ciavarella was clearly still a Democrat in late 2005, and was making what would appear to be unethical campaign contributions to the party.